Beechworth artist Jo Voigt recreated the signatures of Beechworth district women who signed the ‘Great Petition’ of 1891 in an art installation at Beechworth Post Office to celebrate the suffrage centenary in 2008. Beechworth Arts Council took a leading role in celebrating the centenary of women’s suffrage in Victoria in 2008. The state had been the last in the Australian federation to give most women the right to vote in 1908, although they had enjoyed the franchise under Commonwealth law since 1902 – enabling all but indigenous women to cast a vote in federal elections – a year after federation. Australia was the first country the world to give women the right to vote in federal elections and to nominate and stand for election. But in Victoria the campaign for suffrage took another six years before the state government granted women an equality with men to vote for, and contest, state elections. 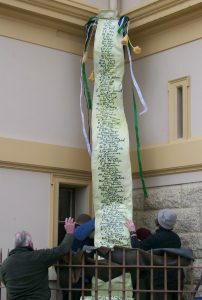 The Arts Council, with support from the Victorian government’s Office of Women, commissioned Beechworth artist Jo Voigt to recreate in canvass and fibreglass the signatures of 154 women from the district who were known to have signed the ‘Great Petition’ – sometimes known as the ‘Monster Petition’ – of 1891. They were among 30,000 signatories gathered in a concerted campaign to press the Victorian colonial government of then-premier James Munro to extend the franchise to women. The sculpture was installed for two months outside Beechworth Post Office – at the town’s major intersection – and became a major talking point for the community. Jo Voigt’s work and accompanying exhibitions flowed from detailed research carried out by the Arts Council’s Cath O’Connor, in which she examined and documented extensive original information about the late colonial campaign in Beechworth to secure the right of women to vote. The usual fortnightly meeting of the above society was held in the Independent Schoolroom on Tuesday evening. The Rev L. W. Lee presided and there was a numerous assemblage. Mr W. Rattray was elected a member and one nomination was received. The business for the evening was a debate ‘Is it desirable to extend the franchise to women? Mr H. J. Floyd opened the discussion taking the affirmative side. He thought it was a subject that was treated too lightly and had not had sufficient thought given to it. But it now was agitating great winds throughout the world. He thought it was a thing that was very much to be desired as the good influence of good women would place better men in parliament and thus tend to improve legislation. As women were governed by laws made in Parliament they should have a vote in electing the persons who make those laws and then we should have purer law-makers and better laws. The Government was supposed to be elected for the people by the people but women were not classed with the people before the laws were made – then they came in – which was very unfair. Dealing with the various objections he instanced the State of Wyoming as a case which could refute all the objections raised. There the franchise had been extended to women for years and they had exercised it freely and had made good use of it. Women were taking great interest in the subject in Victoria as shown by the numbers who were signing the petition at present being circulated. One lady alone in Daylesford had obtained over 500 signatures thus proving they were in earnest and would make good use of the power when they obtained it. The Beechworth celebrations to mark the centenary included Nothing on a plate – a travelling exhibition from the Union of Australian Women shown at Beechworth Neighbourhood Centre in July-August 2008. The exhibition, with photographs and stories from all over Victoria, focused on women and their struggle for the vote, for equal pay and for improvements for women, children and families. They picked up the patter with amazing fluency was another exhibition at Beechworth’s Burke Museum from August to November 2008. In it the stories were told of at least 154 Beechworth district women who signed the Great Petition of 1891 presented to the Victorian Parliament to demand the vote for women. Contemporary artworks by other Beechworth and district artists, including Janet Sutherland, Chris Dormer, Donna Page and Pam Magennis. were commissioned by the Arts Council for this exhibition. The Arts Council was also co-ordinated a celebration lunch in September 2008 at Mayday Hills. It included music performed by young women from Beechworth Secondary College. Keynote speakers included Candy Broad MLC (Northern Victoria), who spoke of women in politics, and Lorraine Lucas, who spoke about her work in mental health care which began at Beechworth’s Mayday Hills Psychiatric Hospital (decommissioned in 1995). There was a themed exhibition called ‘Bring a Plate 2008’ by local artists and performers at the Mayday Store. Beechworth Secondary College year 11 drama students Cameron Hillas, Hannah Neumayer and Shakira Snell presented Celebrating suffrage, which was recorded on DVD. The Arts Council also worked with Beechworth Cemetery Trust to devise a guided walk among the memorials of 40 of the 154 women from Beechworth district who signed the Great Petition and whose remains lie in the cemetery. The Centenary of Women’s Suffrage project was funded by the Victorian Government’s Office of Women.